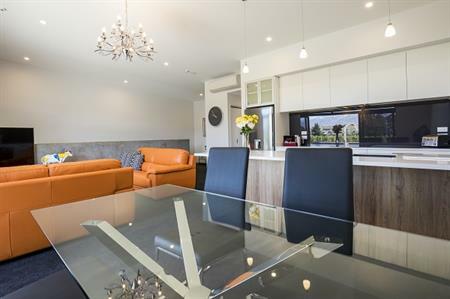 Modern, boutique self contained cottage accommodation for couples, nestled amidst walnut grove and spectacular hosta, woodland and tussock gardens, 3km from Cromwell. Peace and quiet guaranteed, rural views, lots of space. Relax in the ambience of this beautifully restored Bed and Breakfast accommodation. 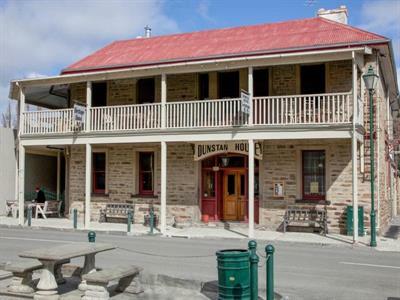 Built from 1898 and opened in 1900, Dunstan House is an iconic local historic building situated in the heritage Precinct on the main street of Clyde. 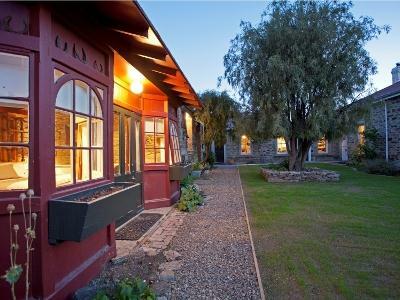 Hartley Homestead Boutique Bed and Breakfast is a grand 1900s mud brick homestead surrounded by almost an acre of lawns and mature gardens on the banks of the picturesque Clutha River. 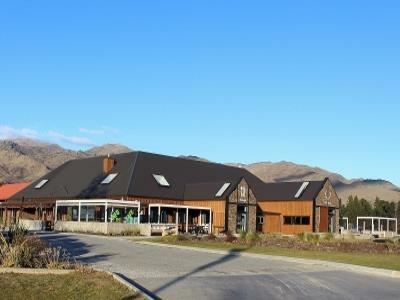 Cromwell's Harvest Hotel is Central Otago's gateway accommodation where all 47 Qualmark rated standard & premium rooms have French doors opening onto stunning mountain, high country & vineyard views. Location is unsurpassed. Just under an hour from Queenstown and even less from Wanaka. Across the road from the Cromwell Town Centre. Next door to Cromwell Golf Course. Vineyards all around. Only moments to Lake Dunstan. The Harvest Hotel is also a popular conference centre and wedding venue. Hawkdun Lodge is a quality accommodation complex offering a relaxing escape with an abundance of comfort, style and space. The complex has 13 attractively presented studio and 1 bedroom units, a large guest lounge, full kitchen for guests to use, an indoor spa pool for relaxing. 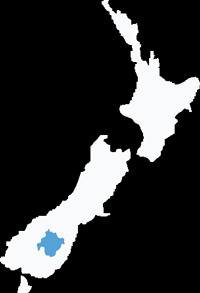 Hawkdun Lodge is located in the Art Deco town of Ranfurly - the main township in the Maniototo Plain. 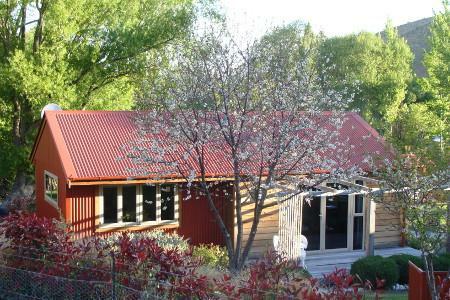 The complex is popular with cyclists because it is conveniently located beside the renowned Otago Central Rail Trail. 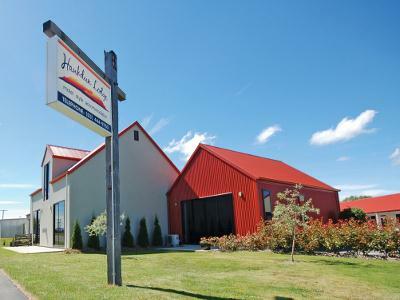 Hawkdun Rise is a boutique vineyard-stay near the town of Alexandra in Central Otago, New Zealand and the first such Bed & Breakfast in the region. Stay with us and enjoy our comfortable, spacious accommodation surrounded by stunning landscapes in the heart of New Zealand's beautiful and most exciting wine region. 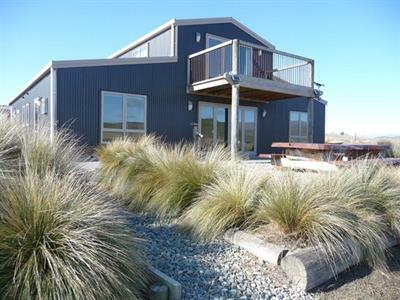 Hawkdun Rise is close to Alexandra, Cromwell, Queenstown and Wanaka, you will enjoy the tranquillity, privacy, great views and great wine. 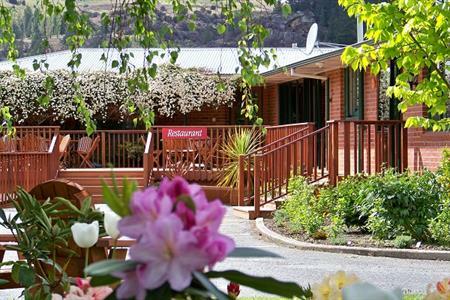 Heritage's Lake Resort offers villa accommodation on the shores of Lake Dunstan in the heart of Central Otago. Stay in one of our luxurious One and Three Bedroom Villas or spacious Double and Twin Studios with facilities on site such as private boat moorings, free guest laundry, WiFi and parking and on site dining. 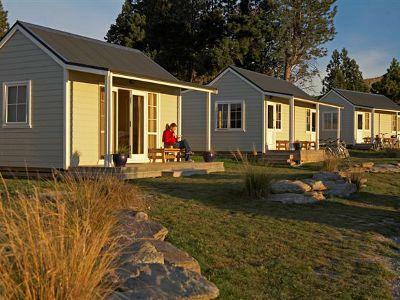 Lake Roxburgh Lodge is utterly unique, offering well-appointed guest accommodation in studio rooms and suites, breakfast, lunch and dinner in the restaurant with Central Otago wines and locally crafted beers. It is the ideal location to base yourself whether it be for exploring the world class cycle trails - Roxburgh Gorge or Clutha Gold or for experiencing a relaxing break away. At Mt Michael Lodge we strive to provide our guests with an environment to relax and rejuvenate, with a fabulous bed and breakfast experience. Whether you are rejuvenating in the spa pool after a walk in the mountains, enjoying a glass of Central Otago pinot noir, wandering around the vineyard or relaxing by the pool, Mt Michael Lodge will meet your every need. 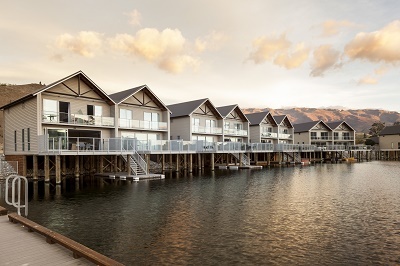 A stay at this distinctly Central Otago property is a unique boutique accommodation experience. Situated in Clyde’s historic precinct, Olivers Central Otago blends the old with the new, creating a modern day ambience within the historic walls. Also on-site, enjoy the fully restored Olivers Restaurant and Bar, as well as the Merchant of Clyde café-bakery-delicatessen and the Victoria Store Brewery's craft beers. Welcome to Pitches Store. Staying or dining at Pitches Store is the beginning of a unique experience. 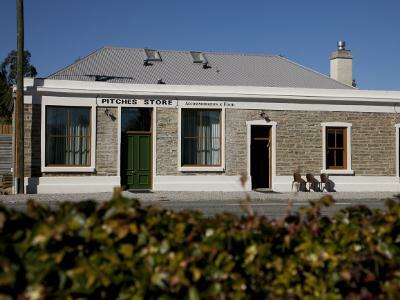 Hidden from the world in the small historic town of Ophir in Central Otago, Pitches Store provides all the charm and special comforts you desire – perfect as Otago rail trail accommodation, for corporate travellers and romantic getaways alike. 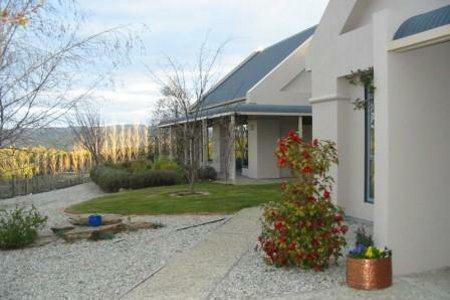 Tussock Lodge is situated 150 metres from the Rail Trail. Just metres from the Otago Central Rail Trail. the historic Waipiata Country Hotel is the only fully-serviced, licensed premises in Waipiata with takeaway meals & refreshments also available. Experience a 'grand' establishment of yesteryear with all the modern comforts of home. Choose from private en-suite rooms with huge King beds, family rooms, or a 19th century mudbrick 'Rustic Room' We also specialise in group accommodation and can configure rooms to suit. Disabled facilities are available. 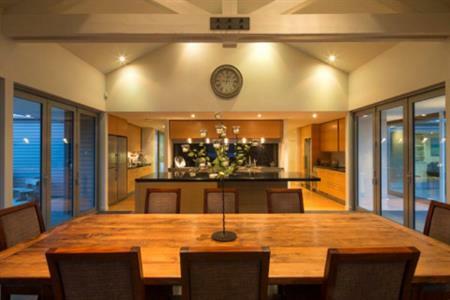 The Duncan Family, a fourth generation Central Otago farming family, welcomes you to the Wedderburn Cottages. Come and enjoy our rural farming lifestyle and experience this amazing part of New Zealand where rural landscapes and historic villages are part of your Otago Central Rail Trail experience. 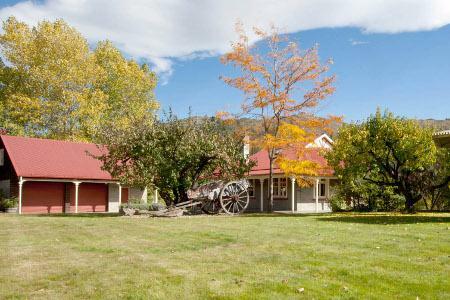 Wedderburn is steeped in history: your stay at Wedderburn Cottages provides a chance to explore our heritage and the rural farming lifestyle of Central Otago.